Presented with a huge array of Oktoberfests and other seasonal beers at BevMo, my eyes lit up when I spied an Oktoberfest made by Ayinger. I am a huge fan of Ayinger’s Ur-Weisse; it’s one of my most oft-purchased and relished brews. 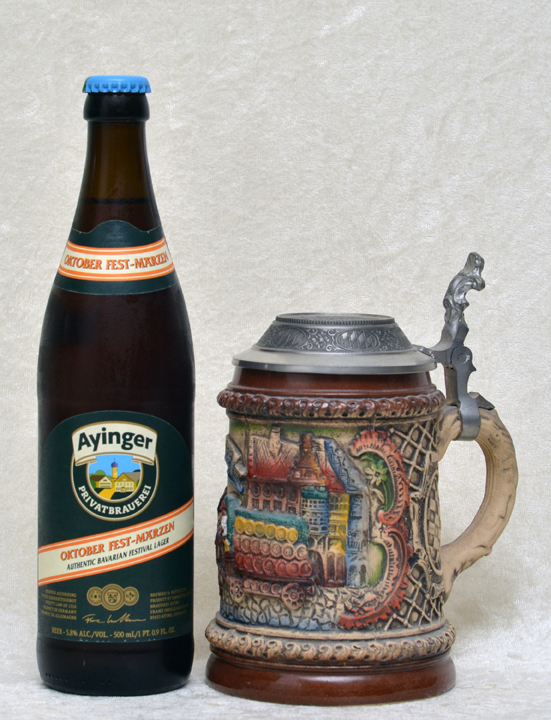 So off to the cash register I went with my bottle of Ayinger Oktober Fest-Marzen and a dose of high expectations. The first warning sign was when I poured the beer and there was absolutely no foam or lacing. The pretty amber liquid laid in my chilled mug like a flat soda. Save for a slight creamy ring around the outer edges, this was the only hint of carbonation. I could smell some hop and malt action, but nothing that excited the senses. First sip…nothing that excited the senses. Subsequent sips…only a slight bitter flavor, maybe some biscuit overtones, but nothing that spoke “Oktoberfest,” “seasonal,” or even “great beer.” In fact, it was so bad, I didn’t finish it. Perhaps this was a bad bottle; perhaps my expectations were too high. But for certain, this is a one-time purchase.